The incredible edible egg—much loved…much maligned. 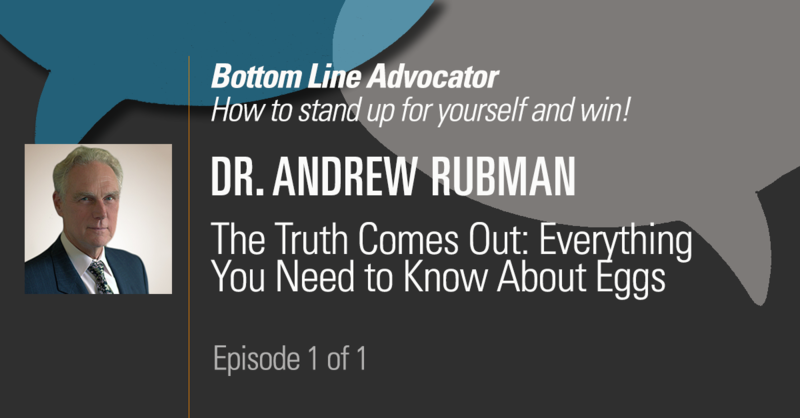 In this episode of The Bottom Line Advocator, Bottom Line CEO Sarah Hiner gets the “bottom line” on eggs from renowned naturopathic physician and self-acclaimed “Egg-spert” Dr. Andrew Rubman. Dr. Rubman shares results of a 500,000-person study conducted in China that produced staggering results that should end the egg debate once and for all. So why are eggs a scapegoat for high cholesterol? And why does the mainstream media ignore the many health benefits of eating eggs? Dr. Rubman explains that and more, including how many and how often you should eat eggs and the best way to cook your eggs to get the most benefit. Get healthy now in this edition of The Bottom Line Advocator.